Arcoframe is your trade partner for UPVC Profile bending. 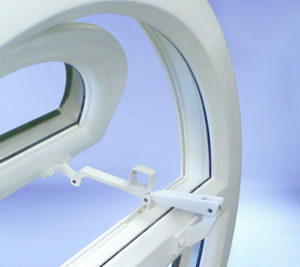 Working to the latest industry standards and techniques, ArcOframe manufacture fixed, opening and full pivot rounded UPVC windows. At ArcOframe we are proud to offer quality and bespoke UPVC round windows as well as oval and circular windows. Our stylish product ranges include bespoke round window frames and circular frames, which are available to order in a range of diameters and sizes. As an experienced and reputable manufacturer and supplier of fixed or pivot opening circular frames, we think nothing less than designing our products to meet your exact specifications. How do round windows work? The ArcOframe experts use precise measurements to manufacture frames that not only work as required but are also aesthetically perfect. 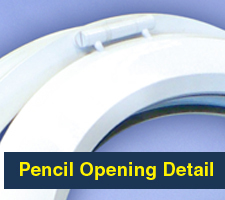 Adjustable friction and safety restrictors are fitted as standard, with a unique pencil operating system fitted in half opening frames. 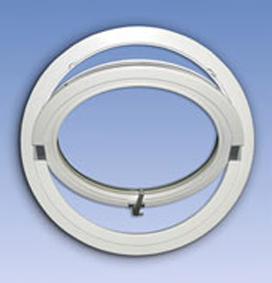 Our half opening circular frames are fitted with a unique pencil operating system, and we are able to offer both fixed and fully operating round windows which are completely reversible. This accommodates ventilation and cleaning requirements in areas which are inaccessible from the outside. Why should you choose a round window frame? An example of a round window frame includes the porthole windows. Our porthole windows are often used on boats and barges to enhance comfort and privacy. These round window frames have adjustable friction and safety restrictors fitted as standard, with the option of adding lockable security catches on request. No matter what you are looking for, whether it be a round window, oval window or circular window, our porthole windows have their own distinctive style and what’s more, ArcOframe offer high quality windows at competitive prices. In addition to this, our fabricators are experts in utilising materials and profile systems effectively which allows them to achieve the best outcome for all designs. For further details or information relating to the round window frame and porthole windows, please give us a call today on 01744 615111 and our friendly team will be more than happy to assist you. We have worked with Arcoframe from the start. We have a good working relationship and will continue to do business with them for many years to come. A great team of lads - providing an excellent service and quality frames. I have dealt with Charlie for many years. Arcoframe provide a fantastic service and great products. For a friendly professional UPVC window profile bending service contact the team at ArcOframe.